This elegant bath set in a greenhouse features a gargoyle as a water spout! 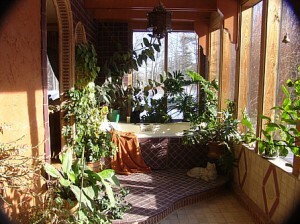 The tropical plants add a great deal of ambiance, expecially when there is snow outside. Several patterns of tiles were used to complete this surround.